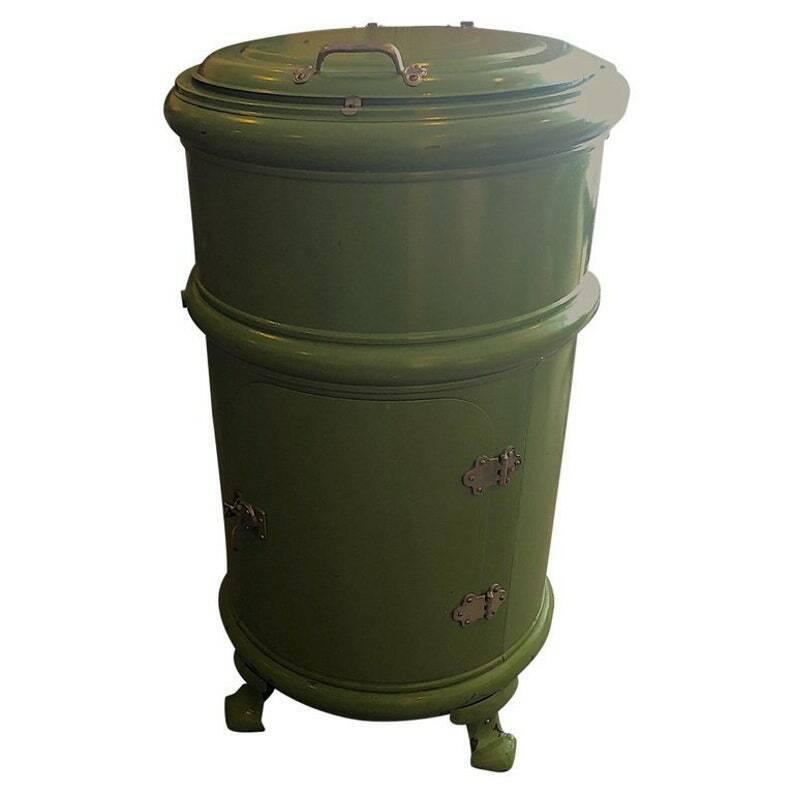 Significant early 20th century steel, painted green, ice box with cool potential to serve as eye-catching bar. Chrome details. Top round opens up as does the side door with round rotating chrome shelves. Put beer-on-ice in the top and glassware or additional potables on shelves. Note some minor dings and scratches; nothing that detracts from overall wow-factor. Dimensions for entire piece are 36" high x 28" diameter. The barrel portion alone is 32" high x 26" diameter. H 64 in. x Dm 32 in. Please continue to visit our site for more architectural-vintage-industrial finds… character pieces for your home and garden. We add five items a week so check back often or convo to be added to our newsletter list. Quality item with unique features. Seller was great to work with! Would absolutely purchase again from this store! A truly unique and remarkable piece. Arrived quickly and exactly as described. 19th Century Wheat Thresher Sled from Spain as Agrarian, Sculptural Wall Art. Listed price reflects 35% savings. ON SALE Coffee Table/Side Table from Trough Used as Salt Lick for Deer and Cows. Ships Free.